On a recent trip to the dollar store, I came across finger lights similar to these. They were $1.00 for four lights. I thought they would be a fun addition to our light table accessories. Plus, my boys love flashlights (what kid doesn't?!). I figured that these would be just as exciting (if not more) to them. So on a particularly dark and dreary morning, I set out a bunch of objects from our light table stash and the finger lights. The materials I used were our DIY color blocks, some translucent WEDGiTS (these were provided to me for free from Imaginability - thank you! ), and some colored tube shots. 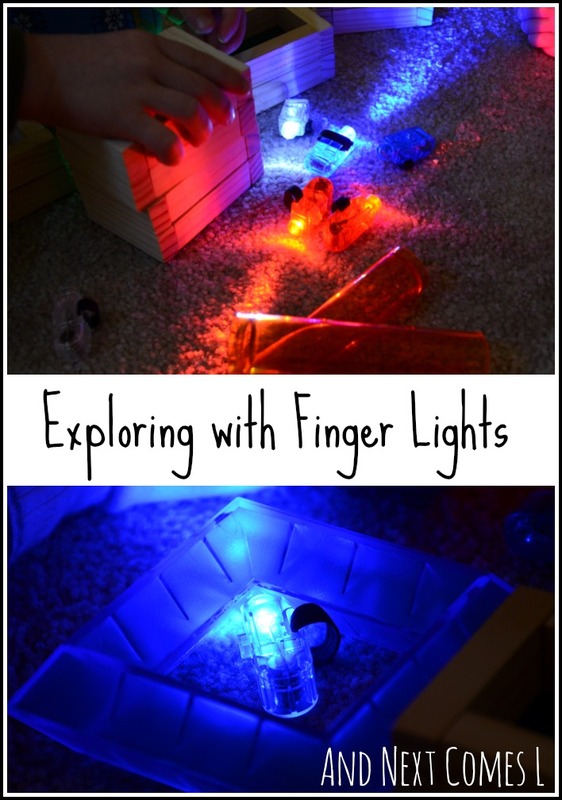 The boys were instantly intrigued and began exploring the different objects using the finger lights. First up were the tube shots. Please note, the finger lights may get lodged inside the tube shots so double check the size first. We ended up using our tube shots from Target here as they are wider than our dollar store ones. That means no finger lights got stuck - YAY! The boys then moved to the color blocks. They stacked different colored blocks with different colored finger lights, which provided them the opportunity to explore some color mixing. K, really liked to cram as many as he could inside one block. Ah, toddlers are fun little people, aren't they? The coolest objects to use with the finger lights, in my opinion at least, were the translucent WEDGiTS. The finger lights really made the colors of the WEDGiTS pop. The boys even made a glowing pyramid with the WEDGiTS and finger lights. Naturally, however, it was destroyed before I could snap a decent picture. This invitation not only added some color to a dreary, gray day, but it keep the boys entertained for the better part of a morning. For other ways to play using the WEDGiTS, you can get some other ideas and read my full review here. How awesome! I love how the fingerlights look with the DIY color blocks! Very cool! Thanks! These finger lights have been very entertaining for K, especially with the color blocks. I was going to say the same thing: My favorite effect is the finger lights inside the color blocks! FUN!